OTTAWA – Prime Minister Justin Trudeau spoke to U.S. President Donald Trump on Monday about Canada's arrest of Meng Wanzhou and the detention of Canadians in China. According to a release from the Prime Minister's Office, the two leaders "reaffirmed the importance of respecting judicial independence and the rule of law." On the call, Trudeau is said to have thanked Trump for the Americans’ statement of support over the "arbitrary detention" of Michael Kovrig and Michael Spavor, and vowed that both countries would continue to seek their release. In addition to these pressing files related to China, the pair are said to have discussed the now-signed CUSMA trade deal; the GM closure; "next steps in addressing steel and aluminum tariffs"; and both Trump and Trudeau’s respective visits to troops abroad in December. "The Prime Minister and President undertook to remain in close contact on these and other issues," the PMO release said. This meeting comes as a Parliamentary delegation that is currently in China, directly called for the release of two detained Canadians and discussed Meng's arrest with Chinese officials. 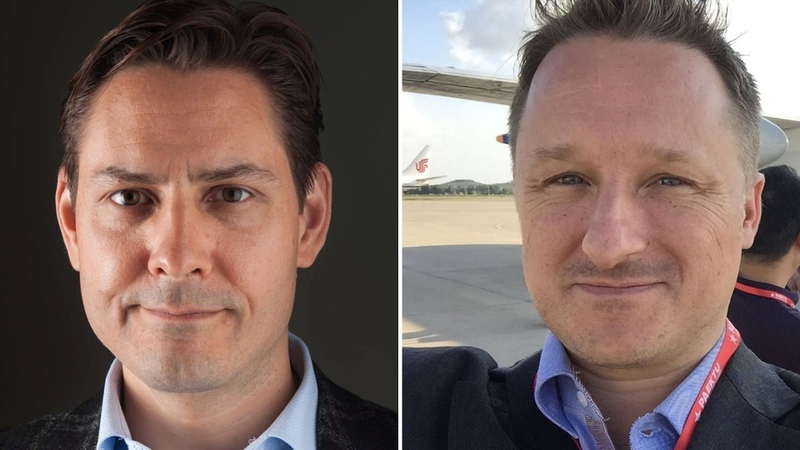 Speaking with CTV News Channel from Shanghai, Conservative MP Michael Cooper said that, during discussions with officials, the delegation stated Canada’s position and called for “the immediate release” of citizens Michael Kovrig and Michael Spavor. "I think by the end the Chinese officials whom we met with, got our message," Cooper said, noting that the people whom they spoke to are not those directly involved in the cases of these two Canadians. Cooper said the delegation met with the Vice Director General of the Shanghai Peoples’ Congress—the local governing body—as well as representatives of the Shanghai Academy of Social Sciences. This is the highest level Canadian delegation to visit China since Kovrig, a diplomat on leave from Global Affairs employed by the International Crisis Group in Beijing, and Spavor, an entrepreneur who organized trips to North Korea, were arrested on Dec. 10. The diplomatic trip, scheduled before last month’s detentions, is being taken by members of the Canada-China Legislative Association, a bipartisan group of four MPs and two Senators with a shared interest in Canada-China relations. The intention of the trip was to discuss bilateral issues such as trade, though the current diplomatic tensions have overshadowed the initial intention of the trip. "This is not business as usual," Cooper said. "I think they understood that this is a serious impediment to continuation of any sort of normal relationship." Cooper said that when the discussions with Chinese officials are about the "unlawful and arbitrary" detention of these Canadians—who are among 13 that have been detained in China since Meng's arrest for various reasons—it makes it hard to talk about how to strengthen the bilateral relationship. He called it the "elephant in the room." The PMO confirmed today that Canada’s national security adviser summoned Lu Shaye, China’s ambassador to Canada, to complain that Canadian officials have not been given enough consular access to Spavor and Kovrig. During the meetings, Cooper said that the Chinese also brought up Canada’s arrest of Chinese telecom executive Meng Wanzhou in Vancouver, which came just over a week before the Canadians were detained in China. Canada arrested Meng after an extradition request from United States justice officials, who are accusing her of misleading banks in an effort to sidestep U.S. sanctions against Iran. "Everything that they said was what has been said by the Chinese Embassy in Canada, a lot of misinformation, a lot of misstatements, inference of the facts, and we corrected them in that regard," Cooper said, adding that the delegation reinforced the independence of the Canadian justice system. An op-ed published Monday in state-linked newspaper the China Daily, links Meng’s arrest to the stalled free-trade talks between Canada and China, criticizing Canada for aligning with the U.S. in the case despite ongoing trade tensions between the two North American countries. "By continuing to follow the U.S., either passively or actively, Canada will eventually harm its national interests," the op-ed reads. "If Canada insists on following the old track, it may not benefit much from a big trading partner like China," it said. Meanwhile, U.S. officials are in China to begin talks that they hope will help to resolve their trade dispute. Both Trump and Chinese President Xi Jinping said they were optimistic about brokering a deal to avert a trade war.